Tulip tree is named for the flowers and leaves that resemble tulips. It grows rapidly and is useful as a large shade tree. The scientific name of this tree is Liriodendron tulipifera. It is in the Magnoliaceae family which includes magnolia trees. The best zones for Liriodendron tulipifera are Zones 4-9. It is native to the eastern part of North America. Tulip tree grows 80-100' tall and 40' wide. The shape is oval or pyramid when it is young, with it becoming irregular as it matures. Choose a location that is in full to part sun for best results. Tulip tree has very unique leaves that resemble a tulip shape. They are bright green and measure 4-8" long and wide. They turn golden yellow in the fall. The flowers are 2-3" long and also shaped like a tulip. The petals are yellow-green, with the center being an orange color. Blooming time is May-June. The tree may take 15 years or more before flowers appear. The fruits are a conical cluster of samaras. Tulip trees, which is also commonly called yellow or white poplar, is not a poplar at all. It is part of the Magnolia family. This is the state tree of Indiana, Kentucky, and Tennessee. The tulip tree grows fast, so it is useful as a shade tree. Since it grows so fast and tall, make sure you choose a location that will hold such a large tree. Be careful planting these near cars (or anywhere else that you would not like sticky honeydew to land on) as tulip trees are prone to aphids. Also, plan to rake up flower litter. 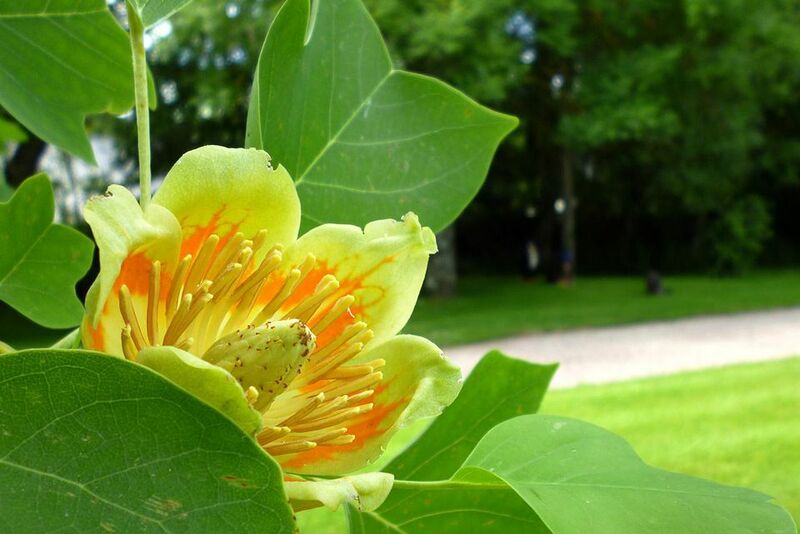 Liriodendron tulipifera prefers acidic, moist, well-drained soil, and is salt intolerant. As the tree matures and establishes its root system, it can become somewhat drought-tolerant, though some of the interior leaves may drop. The tulip tree should be planted in the spring as it is very sensitive to being planted in the fall. If you are planting a tree that is ball and burlap, you should make sure it is watered regularly for the first 3 years or more to properly establish the roots. Tulip tree should be shaped to have a central leader. Otherwise, little pruning is necessary to maintain tulip tree. Any pruning should be done in winter. Liriodendron tulipifera can have problems with aphids and scale. Diseases include cankers, leaf spot, powdery mildew, sooty mold, and verticillium wilt. Leaves may yellow and drop in hot, dry weather.